to speak a great language." Here are the paintings I completed during the month of January 2014. 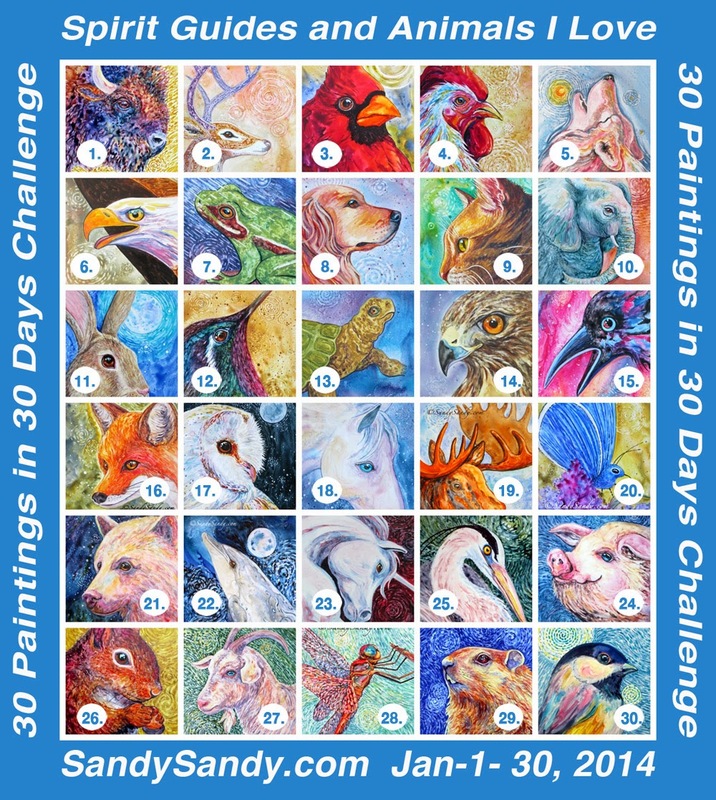 I am very excited to present this collage of artwork which represents my third 30 Paintings In 30 Days Challenge series! Each number and title links to a larger view with painting prices, details and the symbolism associated with each animal. Because I'm envisioning these pieces will make some very interesting groupings, you will receive a discount on original paintings from this series in sets of three or more! Just place your order through the PayPal shopping cart and I'll happily refund 10% of the total price of the artwork. I'm also planning on offering prints in various sizes on a few of these images, based on popularity. If you'd be interested in a print of one or more of these paintings, please leave me a comment with the name or number in the comments section here or on the painting's individual blog entry. Some of these images have been tweaked since my first post, so please follow the links to see the current version. I'd really appreciate your input too. It will be very helpful in deciding which ones I may offer as prints. also happens to the man. All things are connected. Whatever befalls the Earth befalls the sons of the Earth. " "Paintings Inspired By Quotes About Trees"
"Myths, Folk Tales and Legends"
in various sizes on a few of these new animal paintings. Please pick your favorites and voice your opinions! I appreciate your interest and support very much.